Take advantage of gift sets! People, especially women think of Gift sets, solely for what they are meant for gifts for other people. But Gift sets and travel kits can be an amazing way to get to know a brand with out having the purchase full size products of the entire line. I have found some of my most favorite products through gift sets. Where there is just enough product to try it for a week or 2... and then decide. Yes I love it, I am going back for more... or what else is out there... Is there something else better suited for me???? Most brands choose at least one or two of their best products to put in these sets, and then they always add on things that you should try but may not have thought to purchase... make sure to all the products in the sets. You already have them, why not. I got a set with a type of mask I usually do not buy... it is a powder form and you have to mix it yourself... But it ended up being really cool. I tried with with the cleanser from the set and really liked it. Now I am rethinking some other masks that I have passed on before... I may give them a try too in 2013. So if you were super lucky this year and got gift certificates for cosmetics or skin care... Go for a gift set or travel kit... your value will be there! Gold Glitter for the Holiday is a Must! Obsessive Compulsive Cosmetics... what a fun name for a cosmetics line! I mean really who does not feel this way about their favorite products! I was given a few of their nail lacquers (nail polish) to try... and they are Great! i absolutely love them. "A modern colour palette and formulation to match, OCC's professional quality nail lacquers are densely pigmented, quick-drying and super long lasting. Formulated with the Editorial Manicurist in mind, the result is lots of color using very little product for nails that are camera-ready just moments after the application. Available in Satin, Matte and Metallic texture and both Sheer and Opaque finishes." Gold is my chosen color for this Holiday season... It is perfect... Gold goes with everything , looks great on your nails, and if it chips, even slightly not really noticeable... and I am not stopping at Gold, it is the Gold Glitter Nails I am after. After all it is the Holidays! Winter Hair as the weather turns colder... you are inside more... the dry heat is on in your house and work... and car... oh and don't forget most of us are blow drying our hair every time it is washed... which all just equates to a bombardment of dry heat. I am sure if you are anything like me and live in a colder climate, your hands are dry, lips are dry and hair has definitely looked better. 1. Stay hydrated- drink plenty of water even though you are not in the sun all day your body still needs Water! Are you looking for a Perfect gift set for ANYONE? Philosophy Beauty Products can be great gifts for the holidays! This is a beautifully presented brand and they make the perfect gifts. The coolest thing about Philosophy are the messages. Every bottle has something written on it. They are super cute messages, poems, or fun recipes. And there are a ton of gift sets, So when you are gift shopping you shop by the message you want to send, or the beautiful scents that they choose... or by the holiday they have designed the product for. I was just given Snow Angel, in The Philosophy Winter Wonderland gift set. It is awesome. it smells so good... And by the way, they have a really nice quality to their products, so they feel great too. This set comes with a shower gel and body lotion. The lotion is nice and rich, so it is doing a pretty good job with my dry winter skin. Well let me reassure you there are a number of leave-in conditioners that are great for fine hair. I have spoken with a number of hair dressers/ stylists and specialists and one of the most common aspect of leave-in conditioner. They all promote is that it can protect the hair from all the daily streeses and abuses we do to our hair like hair drying, flat ironing, curlers, basically exessive heat. The other comment that is commonly made is that the product itself is great, it is all about the "How" you use it. Brightening Skin Care is a Hot Topic. How do I make my skin look fresh and renewed? How do I diminish that sun damage that seems to appear more and more each year. Skin care brands use the word brightening to mean both and either of those topics. Our skin is made from predominantly 3 things, Collagen, elastin and glycosaminoglycans, with collagen playing the main role at almost 80%. So as you can see right there, this is a very important word in the skin care industry. There are a ton of treatments out there, moisturizers and all sorts of products which contain collagen. In the most basic of terms collagen is the protein structure in our bodies (all of our organs, not just the skin which is of course our largest organ). There is Elastin which is the flexible part, that allows the skin to stretch bounce (and thankfully bounce back), and last but not least is the glycosaminoglycans in the most basic language... are attached to the collagen and are a part of the connective tissue. This is the part which allows water to bind with the skin. So collagen treatments are beneficial because keeping the structure and integrity of your skin strong, will help it from sagging, looking wrinkly and withered. As we get older the collagen in our skin naturally weakens and depletes. Sun damage, environmental stresses like pollution and smoke can accelerate the this degrading process. Colored Mascaras are so cool! I know this week is all about Halloween, and this might be a great time to try one of these out. For me I love colored mascara all year long! There are definitely tricks to getting it to look good. This is something you may need to practice, It is super easy, just takes a moment to try. My favorite mascara for this is the Maybelline New York Great Lash limited Edition, Totally Teal. This is an amazing mascara and the color is so bold that it is easily applied over my dark lashes, You can clearly see I am wearing colored mascara, it is amazing. I do not want this to be a Limited Edition, they should make it a staple! 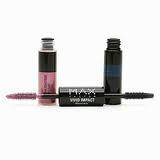 Max Factor Vivid Impact Mascarahas a 2 part system. First you apply the base coat to clean lashes, then apply the highlighting top coat. This seems to help a bit because I have shade 910 which is a very light pink... so I have to use my technique below to get it to really show. 1. Take the highlighting (or color mascara) wand and point it straight at your lashes, so the tip is facing you. 3. carefully run the tip of the wand up your lashes- from mid lash out towards the tip. 5. now turn the brush horizontal and brush on mascara as normal. 6. make sure to zig zag the brush a bit to help the product from clumping or the lashes sticking together. 7. Most importantly- DO NOT BE SHY about building the color and applying more product until you reach the level of bold you are happy with! I would love to hear if you have any tips, tricks, or what your favorite colored mascara is!